There are a variety of baby carriers out there. The question is, which one is for you? Every parent has different needs, parenting styles and lifestyles. It is important to find a baby carrier that best fits in with your individual needs. Take a minute to think of the reasons you are considering purchasing a baby carrier. What purpose does the carrier need to fulfill in your life? Do you need something for around the house to assist you in getting your chores done? Do you want something to assist you when doing physical activity like hiking or exercise? Or is it that you want your baby to be close to you with the benefits of having free hands to assist you in caring for your other children, going shopping, doing chores as well as comforting the baby? What kind of carriers are there? There are a variety of different brands and makes of each type of baby carrier, however the main types include: the sling carrier; the baby wrap carrier; the buckle carrier and the hiking carrier. This design of carrier is fabric with loops to tighten the fabric through in order to position the carrier in the manner you would like. There are many varieties of sling brands like any other carrier. If you choose this kind of carrier be sure to purchase a safe product. I suggest researching the brand before purchasing one. The benefits of this sling are that it is quick and easy to use. Sling carriers are more ideal for new born babies, for short duration usage, a quick hip carry for an older child or breastfeeding. On the down side it only holds on one shoulder which can be a strain on your body. One needs to be careful on how you position your baby so that you do not obstruct their air ways or have them in a position that you cannot see them or monitor them. Baby sense has a baby sling carrier that is quite popular. Again it is up to individual preference whether you like this kind of carrier for your baby, your lifestyle and essentially you. The name describes just what it is – a baby carrier that secures by means of buckles or clips. These carriers usually carry babies up to approximately 9 kg (depending on the make). They are quite versatile for different uses and to share between people such as both parents. Dads seem to prefer this kind of carrier. I find that for very young babies they do not support their heads well enough. I first started off with one of these carriers for my first born child. I found it did not support him well enough when he was younger and then being a big baby he quickly outgrew the weight limit. I also found it difficult as if he fell asleep in the carrier it was very awkward to get him out without waking him. The buckles can be bulky and awkward. If you prefer the support of padded straps and buckles then this one is for you. This carrier is great for short walks or exercising. It’s best for an older baby that can support his/her head in some way. This carrier doesn’t provide that nurturing cuddle for the baby such as with a wrap carrier. It may not be comfortable for the baby for longer periods of time either. The buckle carrier is also quite cumbersome to take with you if you may want to use it later. Credit: SudocreamThis is my favorite of the carriers to choose from. It is a length of fabric that is tied both around the baby and the parent (each make will have instructions on how to tie the wrap). The wrap carrier allows you to carry your baby close to your chest in a kind of kangarooing fashion. I am sure most of you have heard of kangaroo care. This is a type of care and comfort parents give to their babies. More often kangaroo care is given to premature babies. The comfort assists the babies’ growth and development, soothing the new born with skin on skin contact with their parents. It assists in both physiological and psychological bonding between child and parent. The infant’s temperature is regulated as if they were in an incubator by the stable body temperature of the parent. Dr Sears reveals in his research on co-sleeping that it is greatly beneficial to your baby through encouraging more peaceful sleep, stabilising their physiology, decreasing the risk of SID’s (sudden infant death syndrome), creating long term emotional health and that it is in fact safer than sleeping in a cot. This kind of carrier provides both loving nurturance to your infant by being close to you as well as the ease of being practical in order for you to go about your daily activities. It is the most versatile of all the baby carriers. The reason these carriers come in so handy is due to the fact that often your baby may want to be close to you, or not want to sleep unless they are with you. 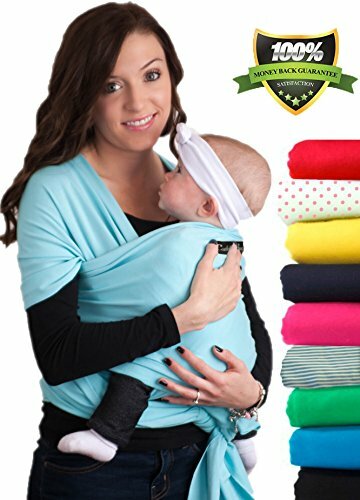 When you have lots to do but your infant won’t sleep on their own this wrap makes life a whole lot easier. Your child will easily be comforted by being in the wrap close to you and you then have your hands free to do some chores or run those errands. Some wraps allow you to have your baby either forward or outward facing, such as the “snugglebug” wrap carrier. The “snugglebug” is made in a cotton fabric. It is particularly good for babies with reflux or colic as it soothes their tummy’s being held in the upright position. The only negative to choosing a baby wrap is that you need to learn how to wear it. After a few times it becomes so easy you will be able to put it on within a minute or two. I suggest that you put the wrap on before going to the shops, so when baby wakes you can simply put them in the wrap. If you are around the house I suggest you put the wrap on when you get up in the morning, so if you are busy with your morning family chores and your baby wakes, once again you can easily put them in the wrap, soothe them and continue with your morning activities. If you are a very active individual and love the outdoors and hiking then this kind of carrier will be essential for you. Hiking carriers are far more heavy duty, sturdy and backpack like carriers. They essentially fulfill the purpose of a backpack and allow you to carry your little one along with you. These carriers typically carry the baby or child on your back unlike the above mentioned carriers which carry the baby in front of you on your chest. These carriers are very sturdy, needing to securely fit the baby in order for the parents to go on their hiking trip. In comparison of the carriers I have discussed my first choice would be the baby wrap carrier. It provides emotional nurturance beneficial to your baby as well as the ease of allowing you to go about your daily activities. Which carrier best suits your needs?